After you create a mount target for your file system, you may want to update security groups that are in effect. You cannot change the IP address of an existing mount target. To change IP address you must delete the mount target and create a new one with the new address. Deleting a mount target breaks any existing file system mounts. Security groups define inbound/outbound access. 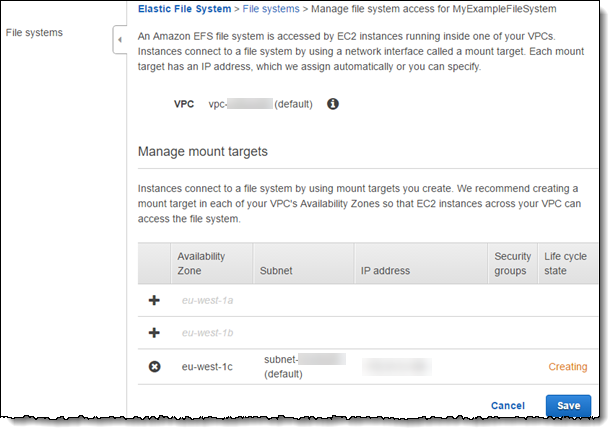 When you change security groups associated with a mount target, make sure that you authorize necessary inbound/outbound access so that your EC2 instance can communicate with the file system. The console displays the Manage File System Access page with a list of Availability Zones and mount target information, if there is a mount target in the Availability Zone. In the Security Group column, you can add or remove security groups. Choose X to remove an existing security group. Choose the Security Group box to select from other available security groups. If you remove all security groups, Amazon EFS assigns the VPC's default security group.